It has been a pleasure for us to interview last week Prof. Jordi Bascompte, researcher at the Doñana Biological Station of CSIC (Seville, Spain). Jordi Bascompte (Olot, Gerona, 1967) has a PhD in Biology from the University of Barcelona (1994). He completed two post-doctoral stays at the University of California, Irvine (USA) between 1996 and 1997, and the National Center for Ecological Analysis and Synthesis, also of the University of California, Santa Barbara (USA), between 1998 and 1999. In 2000 he joined as a scientist at the Doñana Biological Station (CSIC) in Seville, where he is currently a research professor. In 2004 he was recognized, in his first edition, with the European Young Investigator Award (EURYI Award). In 2007 he received the George Mercer Award from the Ecological Society of America for the best article published in Ecology in the previous two years by a researcher under 40 years. 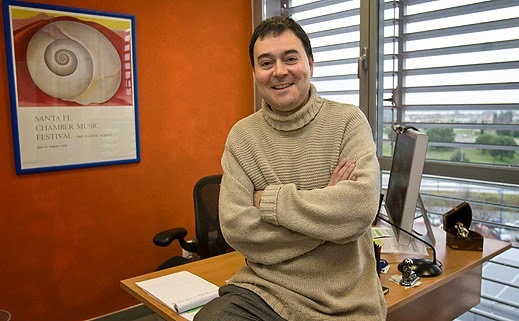 In 2010 he was elected a member of the editorial board of the prestigious journal Science, becoming the only Spanish, until this moment, of the team charged with reviewing scientific articles on the Board of Reviewing Editors. His research interests focus on ecological networks. Species depend on each other through different types of interactions, such as symbiotic interactions between flowering plants and their pollinators. These interactions form complex networks. My research examines the extent to which the architecture of these networks affects their robustness and performance. It is what we call the architecture of biodiversity. To do this we combine different approaches, such as fieldwork, the analysis of large databases and theoretical developments. ARJ: Did you find any difficulty or troubles to be who you are (academically) right now? No, I have never had the feeling of having found a great difficulty. Vocation is a very powerful motor. ARJ: Would you change anything in your path to get here? This is always a tricky question because you always have much more information after than before and the details of a career (not the overall theme) are very contingent. Your own trajectory is a mixture of more or less fortunate amplified or diminished by chance decisions. In short, I am moderately satisfied with my career. ARJ: Which are the factors that you understand most important for success in research? I would highlight the passion, an almost unhealthy passion, bordering on obsession. This is the great motor that drives vocations and the common factor to all the great scientists who I have had the pleasure of meeting. I would add imagination and independence. Imagination to ask you about the big questions and to address them in new ways. Independence, to continue this agenda without interference or taxation. ARJ: Do you consider you spent your time in the best way? In other words, do you have a global time management plan? I feel that it is a very difficult question to answer because a very important part of the research, like the game, is based on exploring and make decisions because you simply it feels good. It is a hardly compatible vision with a useful or optimization carácter, but success is coupled with an increase in commitments. There's a point at which one cannot manage things like before. It is a stressful time until one accepts a new phase. This is where concepts like "global time management plan" begin to make sense. ARJ: How do you normally plan your work? Do you set any list of daily task or goals to achieve? Yes, I set daily tasks and try to combine them with other in the medium and long term. It is a dialogue between these three levels. If you just go with daily tasks you will not do anything else. I try to compartmentalize my workday into different tasks such as management, administration and research. ARJ: How do you set priorities in your work? I approach tasks as concentric circles formed by throwing a stone on water. The first level is my group, my main priority. Secondly, my collaborations with nearby colleagues. Finally the rest of the scientific community. When I have periods of high workload I try to reduce my work from outside to inside. I often see colleagues that invest this order, but for me it is vital to devote to my research group. Secondly, before accepting an invitation I try to visualize how relevant it is and how interested I am in it. In general we must try to keep your own agenda instead of working on the agenda of others. This means being very careful about choosing work topics, collaborations, or invitations to write an article or give a talk. It involves essentially continuously saying no. ARJ: Have you felt exceeded at some point by a high workload? Yes, a lot, as I said before, from a threshold that comes suddenly, almost without warning. Since then, it is a continuum wherein you have to face a management policy of your time. ARJ: Do you know about any time management technique especially useful for research? Common sense, to know what you want and to learn to say no, in a politely but firm manner. Do not let urgent things “eat” important things. Thinking about the big questions. A practical example is learning to control e-mail. In the last years I have gone from check it continuously to do it at predetermined times of the day. There is a time after which I close the e-mail until the next morning. Things like this will result in a large increase in the time available for research. Another example is to plan the topic of a meeting well and limit its duration. ARJ: Do you think you could increase your scientific productivity through a good time management? To a certain extent, yes I do. As I said before, you should have time to stroll around the shores of science. So, joining these two trends, I would say that good time management would allow me to save some time each day to think or write. ARJ: Have you ever applied them in your day-to-day? I tend to do it in the recent years, especially since the birth of my daughter. At that time, the time devoted to work has considerably waned, forcing me to be very organized to try to continue leading our research without sacrificing my family life. I started by renouncing travel and the majority of meetings.